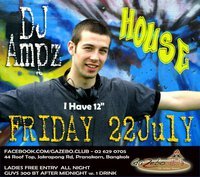 Direct from Canada DJ Ampz spins HOUSE from 2am – 4am!! DJ Remi plays Mashup 4am – 6am!!!! DJ Ampz is the host of Amplified Radio, an internationally syndicated Trance, House, Progressive and Techno radio show which has been on the air weekly since August 2000, currently on over 20+ stations worldwide. The show features both upcoming and established artists, as well as interviews, giveaways and much more in the past 550+ episodes. From there, he created Paradigm United, a music conglomerate including promotions, bookings, labels and radio show. His DJing career has seen him playing directly before or after such names as Markus Schulz, Wippenberg, Blake Jarrell,Andy Moor, Glenn Morrison, Preach, Kenneth Thomas, Elevation, Noel Sanger, Zoo Brazil, Mike Shiver, Airwave, Mike Foyle, Jon O’Bir, Steve Aoki, Hatiras, MC Flipside, Sydney Blu, Marcus Schossow, Tritonal, Macca, Mark Oliver and Carlo Lio in over a hundred venues such as the world famous Guvernment, System Soundbar, Comfort Zone, Vola, Rio and Viva Nightclub (Toronto), Beta (Waterloo) in festivals such as WMC (Miami) @ Dream and Pure Ultra Lounge 10, Aerobar 09 and Ora 08, WEMF (Ontario) & APEX (BC) as well as permanent residencies at Rio (Markham), Purple Room inside Revolution Nightclub, Rude Native, Vault Lounge (Waterloo), Atmosphere & Albion (Guelph) and Coliseum (London ON). DJ Ampz is also the owner and manager of 4Play Trax (House), Ice Media (Chill-out) and Amplified Digital (Tech-Trance), three digital/CD music label launched in August 2007 which focus’s on new talents and quality productions from around the world.